Of all mushroom the amanita is the most widely celebrated. The iconic red and white fly agaric has made it’s way into literature, art, and into our homes. It is said to be a symbol of luck. As I looked around our home, I was struck by just how many mushrooms items we have, and so I though I would share a few of our favorites, as well as some other mushroom things you might love. 1. Hand crotched alpaca mushroom set by Oeuf A special occasion gift, sold individually too. 2. Fauna Jumper Annive for the Minors Last season and on sale! It is about what you love, not the latest fashion! 3. Wooden handle Mushroom Jump Rope Great stocking stuffer. 4. Holztiger Toadstool We adore Holztiger everything! 5. Toadstool Ten Pin Bowls Handmade and comes in a red and white top option too. 6. Organic Vegetable Rattle Set * such a sweet baby gift. 7. Mushroom Growing Kit Fun indoor gardening option in winter. 8. French Knitting Mushroom a great tool for young knitters. 9. Natural Toadstools * incredibly beautiful, you will want to collect them. 10. Children of the Forest By Elsa Beskow * Our favorite author who writes classics books to cherish. 11. National Audubon Society Mushrooms All of the Audubon Society books are super. 12. Musical Mushroom 13. Ceramic Toadstool lamp * We have a plastic version. * Indicates an affiliate link that gives us a small reward for working together. 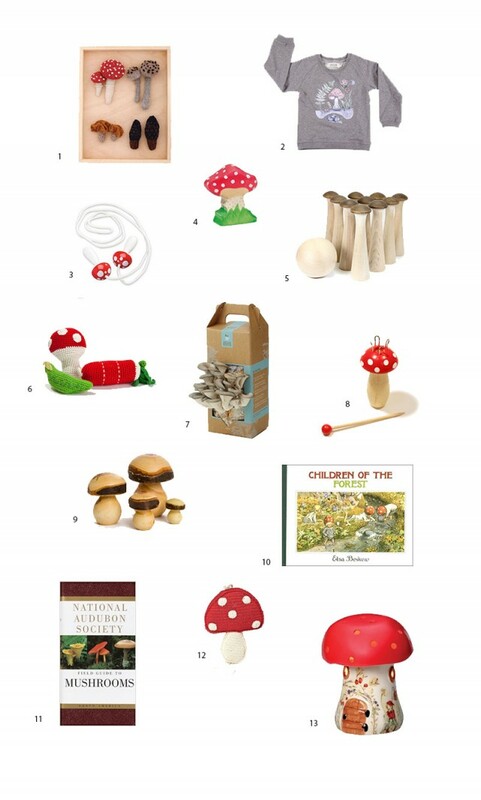 This entry was posted in P L A Y, W E A R and tagged gifts, mushrooms, toadstools, toys. The ten pin set is so cute! Did you know Beatrix Potter was an avid mycologist and that she illustrated many of the mushrooms she found in the woods around her home? I tracked down a copy of her book of mycology illustrations for Dad for Christmas a few years ago. It’s all in French though but beautiful to look at! I think from memory I found it on ebay. Best of luck tracking it down – it’s well worth it! just like morel mushrooms, we leave their roots but cut off closer to the ground so they will come back. As mushrooms, we humanbeibgs need to respect natural environment. co exist. I hope my daughter will learn and respect this natural world.